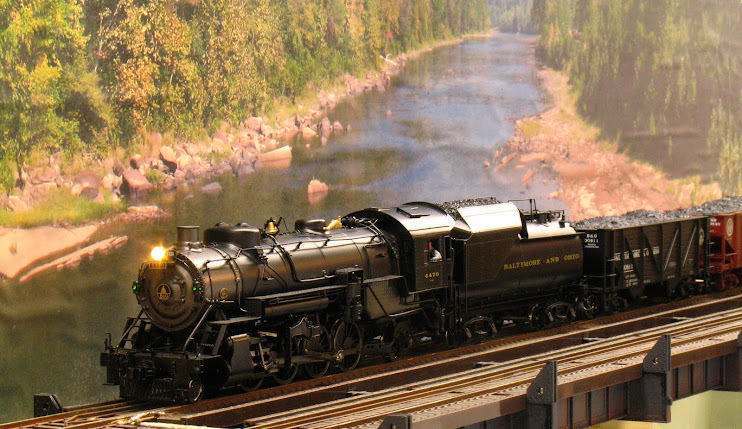 The last two weekends, ending on April 24, I was building turnouts using the Fast Tracks fixtures. This weekend was devoted to begin building the ladder into hidden staging. It's not obvious in these wide-angle shots, but the two tracks nearest the aisle will not hold a train of any significant length. They will either be used for storage of equipment that I do not want to handle taking on and off of the layout or they will hold half of a train each that will be made up by a 'double dip' maneuver when the train is scheduled to leave storage. Three turnouts are needed to connect to the three rearmost tracks and provide a leade for the two tracks nearest the aisle. The ladder was begun by fixing the center turnout, which feeds the center track, in place. Before the second weekend of turnout building, I bought a 1x30" bench top belt sander from Harbor Freight Tools. 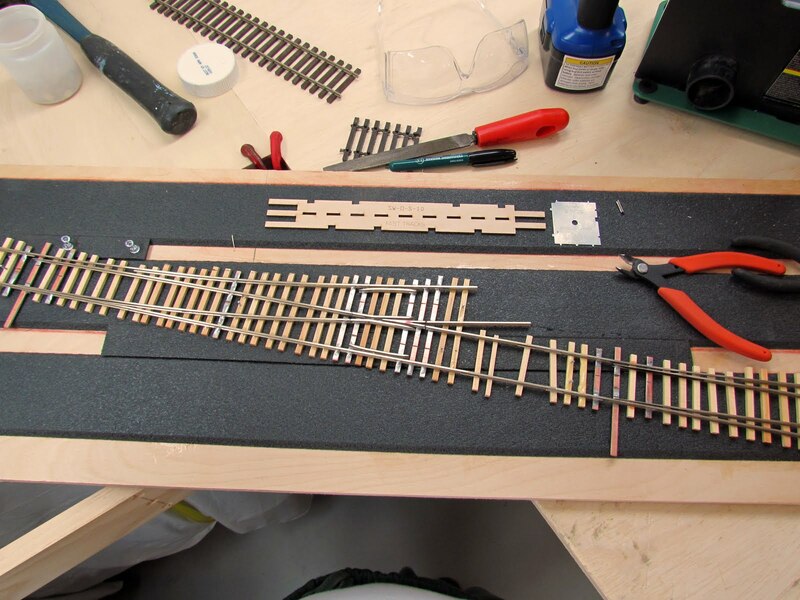 Although this is an el cheapo tool, it makes fitting rail a real pleasure; and I made some joints that are almost imperceptible as joints. 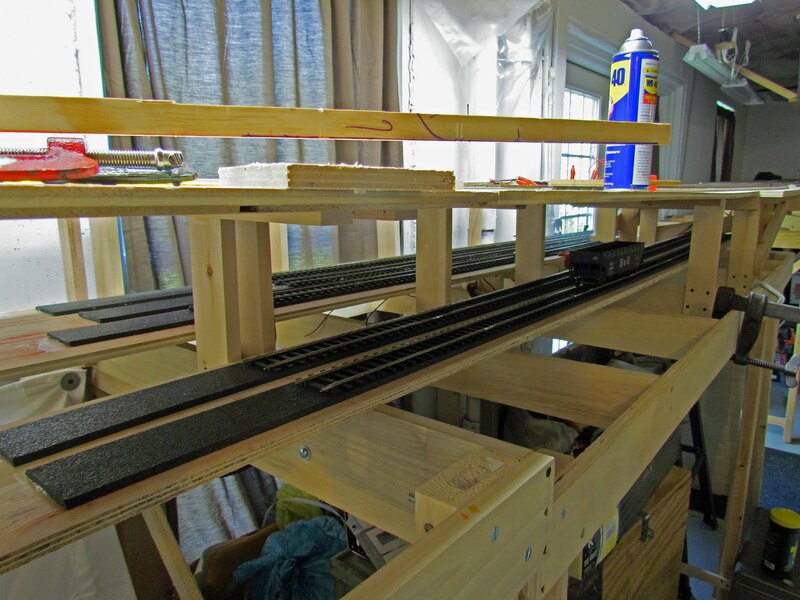 I cut the rail to approximate size, but long. Then I use the sander, removing infinitesimal bits of rail, until it drops into place. It almost takes more time to explain than to do. Finally, the turnout at the beginning of the ladder is put into place. Here is the ladder turned around, so that you are looking into staging as it were from the top of the ladder. I used fewer ties than would be needed if these turnouts were out in plain sight, but more ties than were strictly needed for structural integrity. 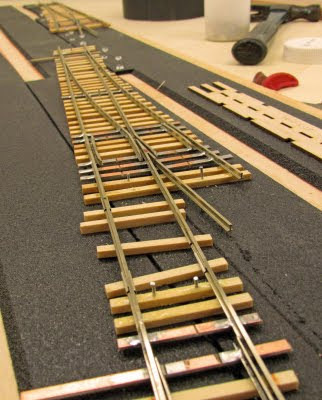 The ties were attached to the Fast Tracks turnout 'skeleton' with epoxy and Gorilla Glue. I used the Gorilla Glue when I ran out of epoxy and I will not use it again. It foamed all over and required a bit of cleanup. I don't know what Gorilla Glue is good for, but fine work is not one of it's uses. None of the ties will be stained as these turnouts will not be seen. 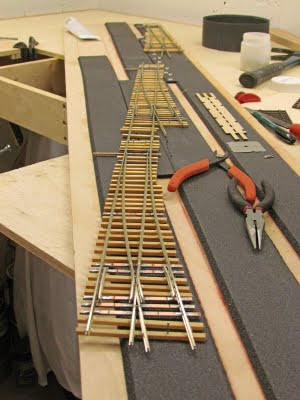 I need to build one more turnout to connect to the last two tracks in staging. 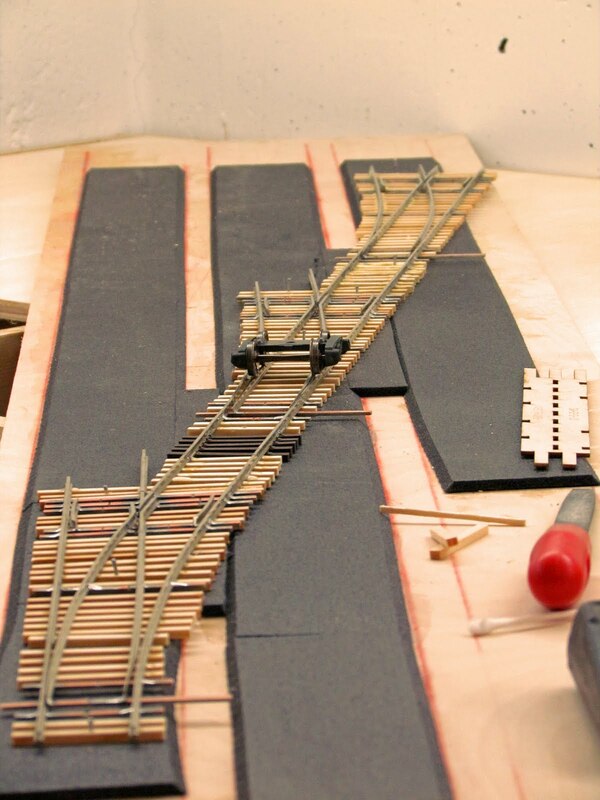 I had been breaking up Micro Engineering (ME) O Scale code 148 flex track to make these turnouts. I believed that I had run out of ME flex track when I found one more piece. One piece along with some scraps that I have for guardrails and the frog points should be enough to make one turnout; however I haven't been able to pull this off yet. I'm going to give it a shot because ME flex track is sold in lots of 6 sections at more than $60 with shipping, ME rail is sold in 99' bundles at over $130 and Fast Tracks does not stock ME code 148 for sale as individual pieces. On the other hand if I'm wrong, it will delay the finishing of staging by at least a week, maybe more.